BookLust: "the best natured and best bred woman in England"
"the best natured and best bred woman in England"
I have been making a concerted effort to read more of the books on my own shelves. Many of those books are non-fiction books about 18th and 19th century Britain, which has been my favorite era in history since reading Jane Austen for the first time. But in recent years, I've moved away from British history, and many of those books have sat unread while my reading tastes have changed. 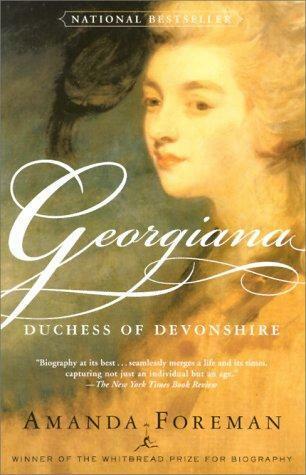 But I picked up Amanda Foreman's Georgiana, Duchess of Devonshire, and I realized that my tastes haven't changed so much. While I am so happy to be reading more widely and diversely than before, I do still love the Georgian era. And very few people personify the era as well as the Duchess of Devonshire. A fashion icon, a published author, a serious party-goer with a gambling addiction, a political powerhouse much more impressive than her husband, an amateur geologist, and a loving mother, Georgiana Cavendish holds, in one person, all the excess and glory we associate with the late 1700s. I am not entirely sure how to provide a plot summary for a biography. Suffice it to say that Foreman gives us insights into every stage of Georgiana's life, from her childhood as her mother's favorite child, to her failed marriage with the Duke of Devonshire, to her desperation to have a son, and her serious, ever-present concerns about her gambling debts. I mean, can you imagine this man with red hair and velvet frills? The mind boggles as to why all painters neglected to include this key identifying characteristic in any of his portraits. She was an acknowledged beauty yet unappreciated by her husband, a popular leader of the ton who saw through its hypocrisy, and a woman whom people loved who was yet so insecure in her ability to command love that she became dependent on the suspect devotion of Lady Elizabeth Foster. She was a generous contributor to charitable causes who nevertheless stole from her friends, a writer who never published under her own name, a devoted mother who sacrificed one child to save the other three, a celebrity and patron of the arts in an era when married women had no legal status, a politician without a vote, and a skilled tactician a generation before the development of professional party politics. Seriously, the Duchess was no joke. We get to know her pretty well, but there are still so many more things I wanted to know. So many things hinted at but frustratingly hard to find out. This may be because so many of her papers were lost or censored by later (ahem, Victorian) generations. It could also be because Foreman didn't have the inclination to write a much longer book. But there are so many events or people hinted at that fall to the wayside later on - for example, what was so unlikable about the Duke's daughter Caroline that everyone commented upon how awkward and weird she was as a child? And then she just disappears! And why in the world did Georgiana's daughter Harryo want to marry her aunt's lover? And what was Lady Elizabeth Foster really after? How did Georgiana treat her servants? How does one even begin to prepare for a dinner party with 1000 guests? I want to know! But what I do know, even with those minor frustrations, is that history has given Georgiana the short shrift. She was so much more than she is given credit for, and when you read her letters and see how desperately lonely she was, and how she overcame that loneliness so much to be politically savvy and wonderfully kind and so generous, you will be as enchanted with her as London society was. But if it was difficult to read this book and not fall in love with the duchess it was well nigh impossible to read it and not be completely astounded by the amount of money the aristocracy spent, burned, gambled, frittered away or just lost track of. Many of these people had 7- and 8-digit incomes or personal wealth and practically all of them were in debt. To each other. For gambling losses. I cannot even comprehend how one can be a millionaire one day and then lose an entire fortune that night to a passing acquaintance. I just... wow. Even though I feel pretty familiar with the Georgian era, I think I must severely underestimate just how strong the sense of entitlement was among the super-rich. I thoroughly enjoyed this biography and highly recommend it. As Foreman points out, Georgiana was in every sense of the word a product of her time. She brilliantly maneuvered not just in the "women's sphere" of hearth and home but also used her influence and friends to make real and lasting impact on the larger world that we historically associate with men. She breaks down the entire notion of "separate spheres" and shows just how valuable women could be in the political arena. She's pretty amazing, and I'm glad to know more about her. Note: The Georgians were really, really dramatic in pretty much everything they did. They wrote very effusive letters, they made grandiose gestures, said very intense things... it was truly awe-inspiring to read. I think the Victorians were pretty dramatic, too, so WHEN DID WE BECOME SO CALM? (Written in all capitals for ironic effect.) I was truly uncomfortable with the hair-tearing, the excessive weeping, the cloyingly affectionate (to me) descriptions - when did this happen? No wonder no one faints any more. We are all in a state of perpetual calm. We are definitely less dramatic than, say, the Prince of Wales was during this time. sounds good! I used to read so much non-fiction and I have gotten really bad about not the last couple years. I need to get to the many on my shelves. That was my goal, too! I feel like in current society, you have to be calm if you want to seem cool, because coolness requires detachment. Getting very excited about things, throwing yourself into things wholeheartedly, etc. can be seen as 'trying too hard' or just nerdy. Perhaps that's why we're so calm? I think that might be what is true currently (though I feel like the fandom/geekdom pendulum is swinging back to it being cool). But I also feel like maybe hysteria peaked in the Georgian/Victorian era and then receded again. I don't really mean so much throwing yourself wholeheartedly into something. I mean, people would literally tear their hair out, throw themselves weeping onto the floor, flail around, and generally create a scene (or maybe in that era, it was totally normal and therefore not a scene?). And the letters, too - just so much PASSION poured into things, and I just wonder where all that went. Maybe it was lost in WWI. I loved this book as well, but I was flabbergasted by the gambling losses!! Hehe, I think the Victorians were a bit less dramatic and it must've just carried on from there. I've been meaning to read this book for years, but I did see the film and that was interesting by itself (I think it answered a couple of your questions, though whether factually or not I don't know). You've reminded me I really should get a copy.